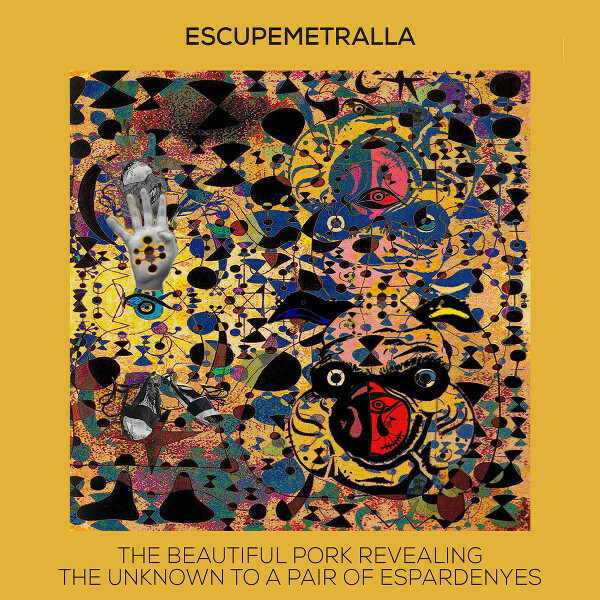 Spanish industrial noisemeisters are back with another short release, the strangely titled The Beautiful Pork Revealing the Unknown to a Pair of Espardenyes. The information on their Bandcamp page for this release is minimal and otherwise extremely obscure. For example, the three sonic collages were “composed and mixed by Escupemetralla in the Soviet Republic of Puigdemòmnia, where entropy is never as it used to be, between March 2017 and April 2018. No animals were harmed (or even used) during the process.” The three pieces of sonic sludge are “Escape from Catalonia 2018,” a soundtrack for a fictional John Carpenter documentary, “Puigdemòmnium,” a mish-mash of electronics and heavily processed found sounds plus a roughly three minute Sci Fi movie speech by an alien race warning Earth to stop its violence or suffer the consequences, and “Barbie Révolutionnaire” with harsh high frequency electronics, processed female voices, mechanical industrial rhythms, and clashing sounds with a rapid snippet of a Barbie TV ad to close the piece. These three tracks create a truly frightening and bizarre musical vision. This music has no commercial value, but could work for an art installation. So beware all who enter the world of Esupemetralla. And if you are all intrigued, you can download the album for free from Bandcamp.